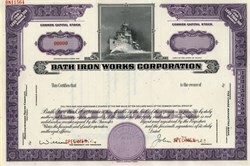 Beautifully engraved RARE Specimen stock certificate from the Bath Iron Works Corporation. This historic document was printed by American Bank Note Company and has an ornate border around it with a vignette of a destroyer. This item has the printed signatures of the Company's President and Treasurer. Bath Iron Works (BIW) is a major American shipyard located on the Kennebec River in Bath, Maine, United States. Since its founding in 1884 (as Bath Iron Works, Limited), BIW has built private, commercial and military vessels, most of which have been ordered by the United States Navy. The shipyard has built and sometimes designed battleships, frigates, cruisers and destroyers, including the Arleigh Burke class, which are currently among the world's most advanced surface warships. Since 1995, Bath Iron Works has been a subsidiary of General Dynamics, the fifth-largest defense contractor in the world (as of 2008). During World War II, ships built at BIW were considered by sailors and Navy officials to be of superior toughness, giving rise to the phrase "Bath-built is best-built." Bath Iron Works was incorporated in 1884 by General Thomas W. Hyde, a native of Bath who served in the American Civil War. After the war, Hyde bought a local shop that helped make windlasses and other iron hardware for the wooden ships built in Bath's many shipyards. He expanded the business by improving its practices, entering new markets, and acquiring other local businesses. By 1882, Hyde Windlass was eyeing the new and growing business of iron shipbuilding; two years later, it incorporated as Bath Iron Works. On February 28, 1890, BIW won its first contract for complete vessels, two iron gunboats for the U.S. Navy. The Machias, one of these 190-foot (58 m) gunboats, was the first ship launched by the company. (Historian Snow (see "Further Reading") says the gunboat was commanded during World War I by Chester Nimitz, an assertion that is not supported by Nimitz's biographers. In 1892, the yard won its first commercial contract for a steel vessel, the 2,500-ton steel passenger steamer City of Lowell. In the 1890s, the company built several yachts for wealthy sailors. In 1899, General Hyde, suffering from the Bright's Disease that would kill him later that year, resigned from management of the shipyard, leaving his sons Edward and John in charge. That year the shipyard began construction of the Georgia, the only battleship to be built in Bath. The ship dominated the yard for five years until its launching in 1904, and was at times the only ship under construction. The yard faced numerous challenges because of the weight of armor and weapons. In sea trials, the Georgia averaged 19.26 knots (35.67 km/h) for four hours, making her the fastest ship in her class and the fastest battleship in the Navy. The company continued to rely on Navy contracts, which provided 86% of the value of new contracts between 1905 and 1917. The yard also produced fishing trawlers, freighters, and yachts throughout the first half of the century. At peak production during World War II (1943�1944), the shipyard launched a destroyer every 17 days. Bath Iron Works ranked 50th among United States corporations in the value of World War II military production contracts. In 1988, the USS Samuel B. Roberts (FFG-58), commissioned two years earlier at Bath, survived a mine explosion that tore a hole in its engine room and flooded two compartments. Over the next two years, BIW repaired the Roberts in unique fashion. The guided missile frigate was towed to the company's dry dock in Portland, Maine, and put up on blocks, where its damaged engine room was cut out of the ship. Meanwhile, workers in Bath built a 315-ton replacement. When it was ready, the module was floated south to Portland, placed on the dry dock, slid into place under the Roberts, jacked up, and welded into place. By surviving a hit that Naval Sea Systems Command engineers thought should have sunk her, the Roberts validated the penny-pinching design of the Oliver Hazard Perry class, the U.S. Navy's largest post-WWII class until the Burkes; and validated the Navy's against-the-odds decision to have picked BIW to design it. In 2001, BIW wrapped up a four-year effort to build an enormous concrete platform, the Land Level Transfer Facility, for final assembly of its ships. Instead of being built on a sloping way so that they could slide into the Kennebec at launch, hulls were henceforth moved by rail from the platform horizontally onto a moveable dry dock. This greatly reduced the work involved in building and launching the ships. The 750-foot, 28,000-ton dry dock was built by China's Jiangdu Yuchai Shipbuilding Company for $27 million. The Centennial Shipbuilders Workers Monument in Bath, Maine is by American artist Guillermo Esparza and is part of the Smithsonian American Art Museum collection. 1967 Bath Industries, Inc. is established as a holding company for BIW, Pennsylvania Crusher and the Hyde Windlass Co.
1998 Groundbreaking for Land Level Transfer Facility. 2002 Realignment of DDG 51 and LPD 17 construction contracts.